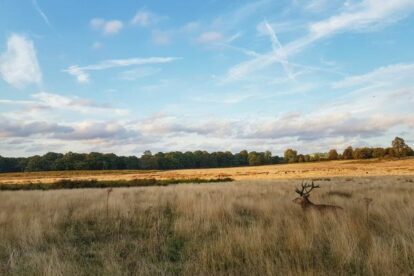 Covering 2500 acres, Richmond Park is the largest of London’s Royal Parks and is only a mere 20-minute train journey from London Waterloo. With overgrown grassland and wide open space, it is often argued to be the most rural and wild of all the capital’s parks; you will feel world’s away from the madness of London’s city centre. The mirror-like lakes, mysterious marshlands and the towering trees all make Richmond Park an idyllic spot to visit, but the 630 red and fallow deer roaming the grounds are the real highlight. During the colder months, wrap up warm and snuggly and embark on a winter walk to spot the graceful creatures through the branches or resting with their herd on the plains. If you don’t get lost, climb up to the grand Georgian mansion Pembroke Lodge for a hearty spot of lunch. From there, you can admire panoramic views of the sprawling park and even a distant glimpse of St Paul’s Cathedral on the horizon.